Want to Party like the Rich and Famous Aboard Mega Party Yacht? If you want to celebrate a wedding, anniversary, birthday party, bar/bat mitzvah, or any event in luxury, like the rich and famous, we can provide the ultimate party yacht experience. Millionaire’s Concierge specializes in delivering memories that will last a lifetime. Our party yacht services are available for any size celebration you have in mind. We can help you plan your event, or you can take advantage of our party planning services and leave it up to us. We can also accommodate corporate events. Whatever your business needs, the yachts of Millionaire’s Concierge will make sure your event is one your employees, investors and customers will talk about for years to come. 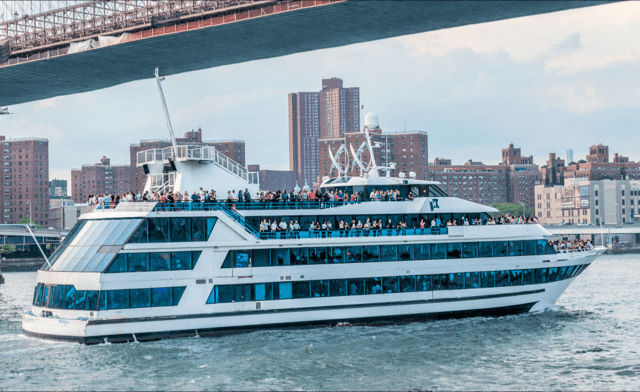 From entertaining clients and investors, to recognizing employees, celebrating milestones and introducing products, you will find one of our party yachts the perfect venue. Whatever you need to make sure your party is a success, just let us know and we will take care of all the details. You decide the itinerary you want to follow. Is your event in the afternoon or evening? Do you want to serve dinner and drinks? Do you want a live band or a professional DJ? Let us know what you need to make your celebration unforgettable and we will make it happen. If I wanted to book a children’s party is this possible? Yes. We will make sure children parties are unique and fun as well. We can arrange magicians, clowns and entertainers that will make your child’s party something special. We can also arrange photographers to capture every minute of your celebration. What type of catering is available? We have connections that include some of the best caterers or chefs in the world. If you have a menu in mind, we will arrange to have the best caterer that specializes in that menu. Professional waitstaff and bartenders round out this service so everyone in your group will have a memorable time. I have a few specific ideas in mind. Can these be accommodated? Whatever you think is going to make your party the event to remember, we can accommodate them. We have some of the BEST party connections around the world that will make your ideas come to life. Let us know and we’ll help you bring these ideas to life.